You know how sometimes you rent a movie, you sit down to watch it, but it’s so bad you don't want to keep watching; but you paid money to see it so you feel obligated to finish it? 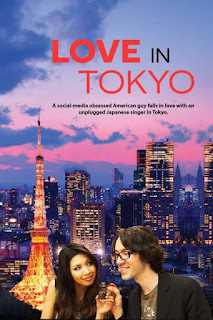 That was my experience with Love in Tokyo, a random recommendation from Google Play, likely from having rented films like Already Tomorrow in Hong Kong. On the outset it doesn't sound too bad. A social networking obsessed loner-in-real-life falls for a hipster with no interest in the internet or modern technology. She's Saki (Itsuka), a Japanese bar tender and budding singer/songwriter who'd rather live in the here and now than keep up to date on the latest trending social media topics. Tom (Jonathan Sherr), on the other hand, can't focus on the here and now because he's always looking at his phone. That's partly because he writes restaurant reviews for the not so cleverly named, bizarre alternate reality version of Facebook, called "Face in a Book." He can offer her a chance to expand her musical notoriety via the internet and she can teach him to unplug and enjoy the wonders of the world around him. There’s also the culture clash side of things. He’s an American from LA who recently moved to Tokyo to write food reviews. And of course, the film spends a portion of its early runtime devoted to watching him fail to connect with the locals. That is until he meets Saki, who is generously willing to put up with this boring loner who's constantly glued to his phone. And of course, because they’re spending so much time together learning from each other they fall head over heels in love. Or at least that’s what the film wants to be about. And for that, maybe it’s heart is in the right place, which is the only reason I'm giving it even a half star. Commentary on culture clash? Sort of. Commentary on over reliance on technology and social networking? Yes. Annoyingly so, yes. It even brings up the devastation from recent natural disasters in Japan even if it feels like an afterthought. But as the great Roger Ebert once told us, “It's not what a movie is about, it's how it is about it.” This film is barely about some of these things, and it’s poorly about the rest of them. This is a small budget indie that feels more like a student film. Yet I saw better student short films than this on a weekly basis in college. Writer/director Michael Solton doesn’t know how to direct his actors, or how tell a story visually, or how to use music, or how to establish tone, or how to edit it all together. If this were a student film, his professors would have given it a failing grade. There’s nothing that works about this film in terms of both production values and storytelling. It trades any potential drama for generic sitcom style misunderstandings. And many of those misunderstandings don’t make any sense. None of these people are believable. After falling for Saki, Tom sees a photo of Joey (Jason London) - an American acquaintance who just happens to be in Japan - kissing Saki. The fact that that happened in the first place is out of character for her. Out of jealousy Tom calls Joey for a night of drinking at the club, instead of confronting Saki. I’d like to think most people aren’t this stupid. I’d like to think they’d talk to the girl they’re with rather than go hangout with the guy she might have cheated with. But that’s only the biggest of the logical lapses and character inconsistencies this film suffers from. It does nothing to change its central character in a real or meaningful way, and it doesn’t make any sense of why these two people would be together in the first place. More often than not Tom and Saki spend their time arguing over the necessity of social networking and smartphones rather than connecting on any level. But all of that is why the story and characters fall flat. I assure you most viewers will give up on this film long before it has a chance to show those cards. Lead actors Jonathan Sherr and Itsuka are aspiring actors who simply don’t have the talent or charisma at this stage in their careers to carry Solton’s stilted dialogue and lackluster character arcs. Jason London is the only actor here who possesses any sort of screen presence, which makes it regrettable that he is relegated to the role of a background player. Solton even reserved a small role for himself. If only he’d had another producer or director to tell him no. Worse yet Solton repeatedly makes his actors look worse because he doesn’t know where to put his camera, or even where to make his edits from scene to scene. Many scenes just feel hacked off willy nilly, most noticeably a scene toward the end involving Itsuka’s musical performance. Speaking of music, Solton opted for using a handful of generic royalty free songs that seem to play on a loop in the background throughout the entire film. It isn’t just that the music is bad or repetitive (though it is), but Solton doesn’t even bother looking for songs whose tone match the scene they’re playing against. Quite often an upbeat song plays in the background of a scene in which Tom is troubled for one reason or another. It’s this kind of failure to understand basic filmmaking techniques that continually plagues Love in Tokyo. The title itself is even generic, unexplainably changed from the much better title “When Sushi Met Saki," playing off the girl’s name, Tom’s nickname, and their affinity for meals made up of sushi and saki. This is the SyFy original movie of travelogue romcoms. A movie with a low budget and no name actors that’s so amateur it shouldn’t be taken seriously. But that’s no compliment. That might work for SyFy movies because they’re intentionally bad, aiming for that “it’s so bad it’s good” market. But that style doesn’t transfer to this genre, and it’s clear Solton genuinely doesn’t know he’s making a bad movie. Anyone who follows this site knows I’m usually fond of fish out of water tales, of travelogue romances set abroad, or stories about culture clash. I enjoy movies that take me to different places around the world. I like movies about just two characters connecting, especially when they’re carried by two charming leads. This film fails on all fronts. It isn't even enjoyable for its location. It might well have been shot anywhere but with stock footage of Tokyo intercut as occasional establishing shots. It is definitive proof of how difficult films are to make. Don’t bother seeing this one. It isn’t just the worst example of the genre, it’s one of the worst films of any genre I’ve ever seen.